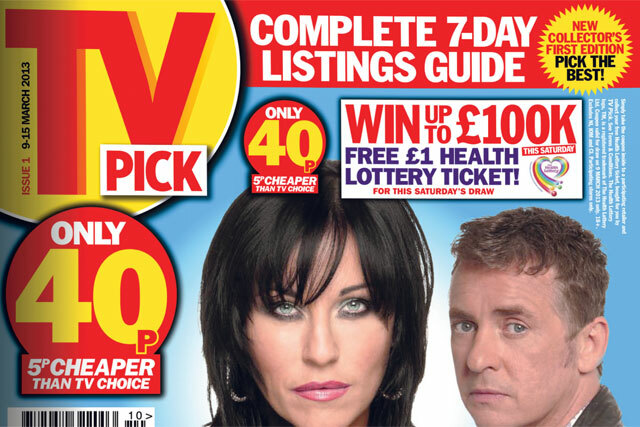 Northern & Shell's weekly listings magazine TV Pick will close tomorrow, four months after it launched in March. The news brings to an end Northern & Shell-owner Richard Desmond's aim to shake up the TV listings market by launching the first major title in the sector since 2005. The magazine planned to challenge the market leader, H Bauer's TV Choice, which is the UK's best-selling paid-for magazine, and recorded an average weekly circulation of 1.23 million in the last six months of 2012. Media agency sources reported that sales of TV Pick were averaging around half of Northern & Shell's long-term target, believed to be 750,000 copies a week. Desmond initiated a price war by bringing the title to market with a launch price of 40p, 5p lower than TV Choice. TV Choice responded by cutting its price to 38p. In retaliation, the second issue of TV Pick had a slashed price of 20p, a figure then matched by TV Choice. A spokeswoman for Northern & Shell confirmed the closure, but declined to comment further. The magazine was on sale at more 50,000 retailers.